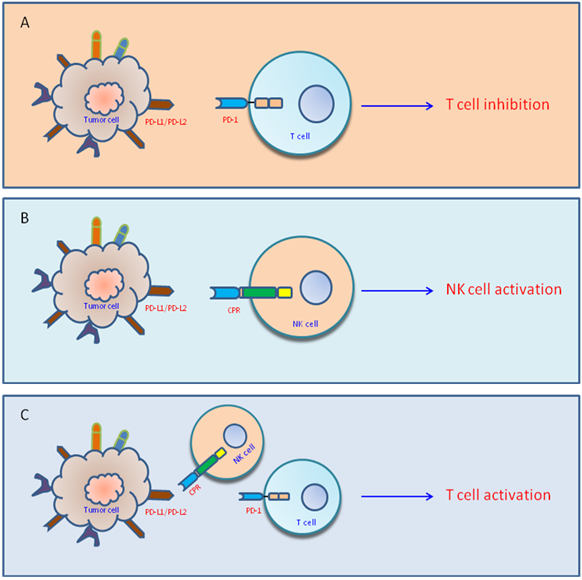 NK cells are unique lymphocytes that can elicit quick response against stressed cells including virally-infected cells as well as cancer cells, without the need for prior sensitization. Unlike T cells which will not respond when the MHC is absent, NK cells can kill the target cells when the self MHC molecules are missing (So called “missing self” theory). Cancer cells express high level of PD-1 ligands which will interact with PD1 expressed on activated T cells, therefore delivering a signal that inhibits activation of IL-2 production and T cell proliferation (Figure A). One of our TANK™ platform is a Chimeric PD-1 Receptor (CPR) stably expressed in a NK cell line. Once in contact with PD1 ligand, NK cells will be activated to release Interferon gamma, perforin, and granzymes which will kill PD1 ligand expressing cells (Figure B). Additionally, CPR-expressing NK cells can also activate T cells by blocking PD1-PD-L1 interaction (Figure C).